The Deluxe Edition Artisan tilt model is the same mixer as the KSM150 Mixer and instead of stainless steel bowl it comes with a glass bowl. The advantages of the glass bowl are that it is dishwasher safe as well as microwave and freezer safe. The KitchenAid Deluxe Edition includes the wire whip, flat beater and dough hook and also includes an extra Flex Edge Beater which the ksm150 or ksm155 do not inlude. This innovative accessory scrapes the sides of bowl as it mixes keeping ingredients from accumulating on the side of the bowl mixing more thorough. 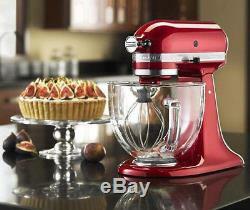 The KitchenAid Mixer brings innovation and style to your kitchen. The 10 mixing speeds provide flexibility and control whether you're creating a new recipe for cupcakes or your famous herb mashed potatoes. And the tilt-back head provides easy access to check on ingredients or change accessories. Use the dough hook for breads, pizza dough and yeast rolls. Whip perfect icings with the wire whip. From main dishes to dessert, the KitchenAid glass bowl Series Stand Mixer makes your kitchen dreams a reality. With measurement markings on the side in liters and cups, the glass bowl is both handy, beautiful and multi-functional. Simply remove the round, metal medallion on the front of the mixer, attach the accessory to the power hub and you're ready to grind choice meats, prepare fresh applesauce or make delicious, homemade pasta. ATTENTION ALL CUSTOMERS: ALL ELECTRONIC ITEMS ARE 110V. 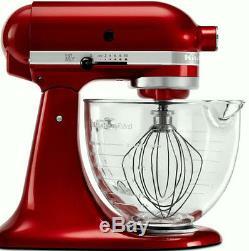 The item "KitchenAid Stand Mixer WithGlass Bowl Delux Artisan Tilt Gloss Cinnamon Dark Red" is in sale since Friday, November 1, 2013. This item is in the category "Home & Garden\Kitchen, Dining & Bar\Small Kitchen Appliances\Countertop Mixers". The seller is "usa-world-sales" and is located in Los Angeles, California. This item can be shipped to United States, Canada.